Espresso Measuring Shot Glass 2oz Lined. 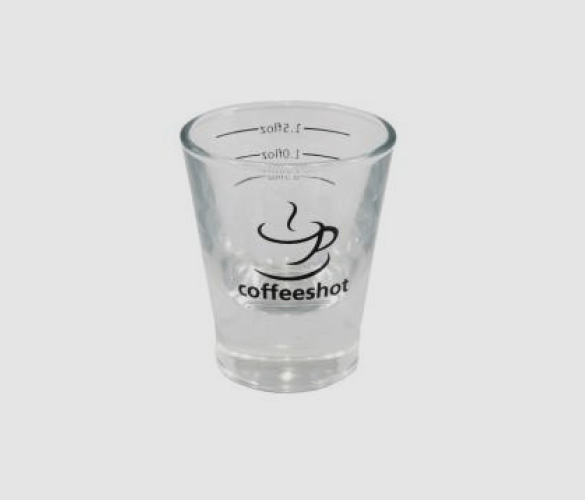 This espresso measuring shot glass is an essential part of any baristas brewing kit. It takes the guess work out of measuring your shots and is a simple way to achieve the perfect espresso. The high-quality glass allows you to see exactly how much coffee is being pulled, unlike other cups on the market that don’t allow you to see how much has been poured, which can lead to inconsistencies when brewing. Not only does it feature high quality glass, but it also has useful measurements on the side for extra precision. The glass is 2oz, and the measurements printed on the side indicate 1.50z, 1oz and 0.5oz. This allows you to customise your espresso by finding the perfect amount for you. You are then able to replicate this perfect amount by noting down the measurement. This espresso glass also features a coffee cup design on the front which is ideal for coffee shops, cafes restaurants and other businesses that enjoy a stylish design on their crockery. How large is a shot of espresso? Typically, a single shot is one fluid ounce and a double is two fluid ounces. Although, this may vary slightly from business to business. Generally, a single shot of espresso is used as the base of most drinks, such as cappuccinos, lattes, mochas and americanos. A double shot can be used, but baristas only do this when requested by the customer. A single shot should last around 20 seconds when pulling from an espresso machine, and a double should take anywhere from 20 to 25 seconds. If it is taking much longer than this, adjust your machine to a more course grind setting. This will make it easier and quicker for the hot water to navigate through the grounds and into the cup. If it is much quicker than this, adjust the machine to a finer setting. This creates less space between the grounds and makes it harder for the water to get through, which creates a longer extraction. This cup doubles up as an espresso shot and measuring glass and is a favourite amongst many professional baristas. Not only can it be used to time the perfect length for a shot, but it can also be used to create speciality beverages. When using a tall latte glass, you may find it difficult to fit under the portafilter spout. Simply use this espresso cup to pull the shot and pour into your latte glass for much more efficient and safe brewing. Another benefit you will notice of this glass is that it widens at the top. This is said to ‘hug’ the coffee and holds the crema perfectly on the surface, which are what many customers look for in a shot.